Serenity have come a long way since they unveiled ‘Worlds Untold & Dreams Unlived’ back in 2007. Although that debut hinted at such big things to come, in the intervening years the Austrian symphonic metal band have created their own identity through a series of almost flawless releases, and now with ‘Codex Atlanticus’ they have delivered as perfect an album as you could wish for. 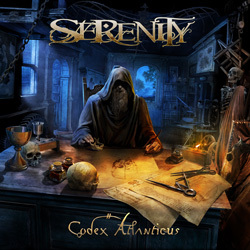 Songs like ‘Spirit In The Flesh’ and the frenetic (although oddly titled) ‘Sprouts Of Terror’ ably showcase what Serenity have to offer: with its luxurious orchestration and choral parts, stunning guitar work and beautiful keyboards ‘Codex Atlanticus’ is a work of pure majesty. There’s nothing on the album that hasn’t been thought through and perfected, before being polished to a high sheen and executed by a group of musicians at the top of their game. And its beauty isn’t just skin deep: the songs have both breadth and depth – each listen reveals something new – and there’s something almost magical about the way the band bring them to life. Much of the credit goes to frontman Georg Neuhauser whose stunning vocals lift the songs way above even the extraordinary, although that’s not to belittle the contributions of Chris Hermsdörfer, Fabio D’Amore and Andreas Schipflinger: there’s no slouches in this band. There is, so say, a concept running through the album relating to Leonardo Da Vinci, but don’t let that get in the way: the concept never gets in the way of the songs, and reviewing the album without lyrics it could be about Leonardo DiCaprio for all I know. The fact remains that it’s a beautiful body of work, just the sort of thing you need to blow away the January blues, and maybe a contender for album of the year – with just eleven months to go! Three words: immaculate, exciting and opulent. What’s not to like?